Seventeen books from the "Junior Deluxe" series, many are illustrated. Lots of classic juvenile titles in there, from "Eight Cousins" to "The Wizard of Oz." What a lovely looking set and I hope I win! What a fantastic giveaway! Happy Mother's Day, moms! What a great way to celebrate the holiday - here's hoping I win! I Loved those books as a child! What a beautiful set. I would love to read these to my boys. I'm a mom of 2 young ones & I could get some use from these! Thanks for the giveaway & happy Mother's day to all the moms! Oh, my goodness, I LOVE those! I'm in! My mom would love those books. I have a few of these. It would be nice to have a set of them. Gorgeous :D Fingers crossed for winning! Beautiful -- count me in! I owned (and treasured) most of those as a child. It's a beautiful looking collections. Terrific set of books and I remember reading a few of these as a kid. Love it!!! I hope I am the lucky winner. Cool collection! I'd love for them to be on my shelf! This is a fabulous giveaway ~ thanks for the shot! I'm actually not entering; I just wanted to comment that I have a sizable selection of those books! 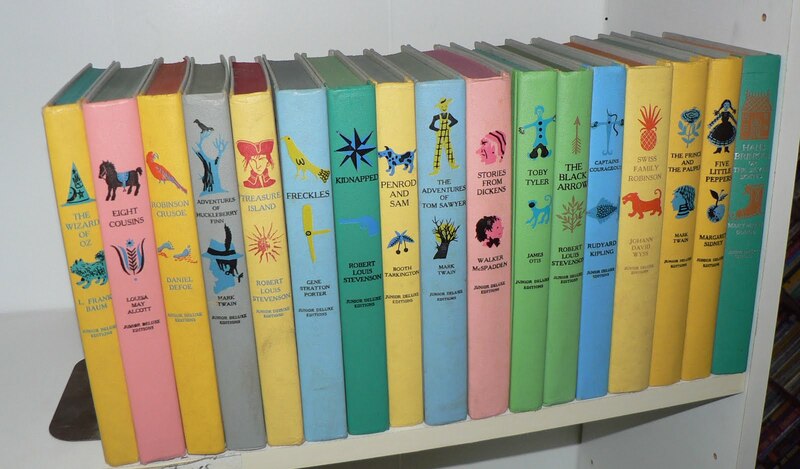 My brother must've had a nearly complete set as a child, and I read lots and lots of those editions. They look dated now, but they're quite well done. Good books! Great titles and I love the colors! My mother wold love to read these to my nieces and nephew. What a nifty set! I love it. How beautiful! I'd love to read those with my little boy. What a great giveaway! I'd love to enter! My grandmother had this set and I loved reading them as a girl! Thanks for the opportunity to win such a great giveaway! oooo pick me pick me! what a lovely set. My grandparents would send these to me for my birthday when I was younger (much younger). Looks like a fun set...count me in! I remember some of those books--my mom had some of that set, and I'd love to share the rest with her!